This has been more than a 15-year project: the first 15 years were used trying to convince my husband to let me do it. It has taken the last 9 months for me to actually build it. I wanted to take a diversion and attempt to carve a shoe with Jordan’s help, but my husband encouraged me (threatened me – LOL) to continue with the closet. The bedroom is somewhat smaller than a walk-in closet in today’s mega-homes (thus the problem getting all three cabinets top-to-bottom in the photo). There was no closet in the bedroom, only a 48” Sauder wardrobe. To install these cabinets necessitated the relocation of the door, which meant relocating an electrical switch; thus, the 15-year “convincement” period. The cabinets were made in three 35-inch-wide vertical units without the top enclosure. The cabinets sit beneath ductwork so the top enclosure was added after we moved them into place. I designed the center cabinet to set behind the face frames of the side cabinets. Because all the oak was dead wood milled off our property, the cost of these units was quite reasonable. It is not select-and-better quality of oak but the Lord provided amply. Since we paid for a sawyer to bring in his bandsaw mill, I used about $50 of oak for the cabinets.  $75.95 – Finishing supplies (stain and varnish).  $136.47 – Hardware. We had all of the handles from a previous kitchen and only had to purchase 8 additional hinges (at $.25 each). Drawer slides were the largest portion of hardware expense. 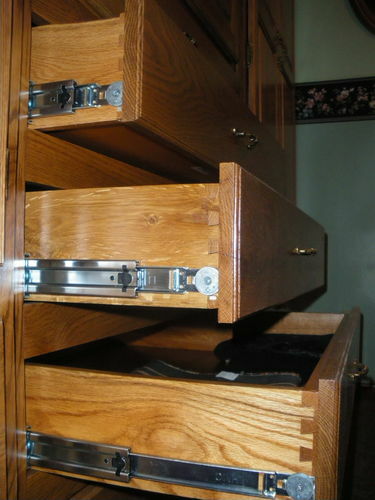 The drawers are oak (some ash mixed in), machine dove-tailed, with full-extension drawer slides. I still want to make dividers for some of the drawers. I also have two long mirrors to frame and install in the right hand cabinet. Thanks for taking a look, and for your comments and critiques. I’m showing this beautiful work to my wife so she can get busy. And you fish too! NICE work. Looks nice. I see you did a little changeup for the center doors top rail but it works. You will enjoy that piece for many years. Looks like a very good job on them from here!! Beautiful job, very nice. You’re going to like those for years to come. Now how about a picture with the doors open, or have you filled it up already? WOW! What an ambitous project. GREAT work. Very, very impressed. Love the design, stain, and finish. Fantastic addition to your bedroom. Bravo! Re. Price – I agree with Bentlyj above. Somewhere in the $5,000 to $7,500 range (installed / with mouldings like you have done) would not be out of the question. Now, tell hubby you are going shopping – some major tool purchases are in order! Thanks for sharing and enjoy (the built-ins and new tools). What a great job you should be proud!!!! Looks perfect! What a great feeling of satisfaction. Awesome job. I was guessing $8K. Super job- and what a lot of confidence to even think that you could do that job. Excellent. Thanks to your mention of the shoe carving blog I just spent part of my morning checking it out. Now that is the way to do a carving tutorial blog. Makes me want to carve a shoe too. Beautiful cabinet work. Something like this would look great in my bedroom but if I tried this it would be like committing to a whole new bedroom set. That would be a long project, for me anyway. Thanks, everyone, for all your encouragement. And thanks for the feedback on what they might cost. It looks like I’ll be spending the next few months shopping! ;-) I knew I had saved a considerable amount of money by making them myself, but didn’t realize how much. The truth is, I would still be living with the Sauter wardrobe if I had to pay for someone to make them for me. But today I want to sew new draperies for the room so I won’t be in the shop. very sweet. I am working on something similar for my bedroom. It has taken almost a year for me to complete as well working weekends and some evenings…on the home stretch now, just wish we would get some warmer weather to help with the finishing..
Depictureboy, I got my inspiration to make these from the cabinets in my sister’s master bedroom. (She has twice as many, but her bedroom is four times the size, too.) It seems like it must be getting more popular since there have been several similar ones on here lately: Bentlyj, syeret, RSmike, to name a few. We’re looking forward to seeing yours, too. Absolutely Gorgeous! You have the talent, spend the bucks to get the equipment you want! Keeps you busy during the long winters in Wis.